It seems fair to say that Google dominates in most areas online, apart from social media, where their attempts have been mostly unnotable. Having tried and failed with Orkut, Dodgeball, Buzz and Latitude, the only Google social media platform that is still active is Google+, now named G+. However G+’s social media presence is only a paltry 0.4% of Facebook’s. Facebook boasts 1.5 billion daily active users, which compares to Google+’s claim in 2013 that they had 540 million monthly active users. This was subsequently knocked down further by data from StaticBrain which estimated that only 4-6 million were active in 2017. The Local Search Association conducted research in 2016 which found that word of mouth – or referrals from friends and family – were of almost equal importance as the company’s website when looking for information and products. 82% of consumers relied on personal referrals, whilst 92% used search engines most frequently. However, in a separate study by Nielsen, it was found that consumers trusted recommendations far more than they did any other source of information. Despite being a less trustworthy source, search engines are the most popular information resource as they provide quick and easy access to it through mobile devices. However, social media is stepping into this realm as it makes ‘word-of-mouth’ referrals equally easy to access. Facebook have nailed personal recommendations. Having introduced maps, reviews, recommendations and search functions within its platform, they have cleverly combined the best elements of social media with those of traditional web searches. Facebook is reaping the rewards of these new features – as are businesses; a recent study by Facebook found that that two thirds of their users visited a local business page or event at least once a week. 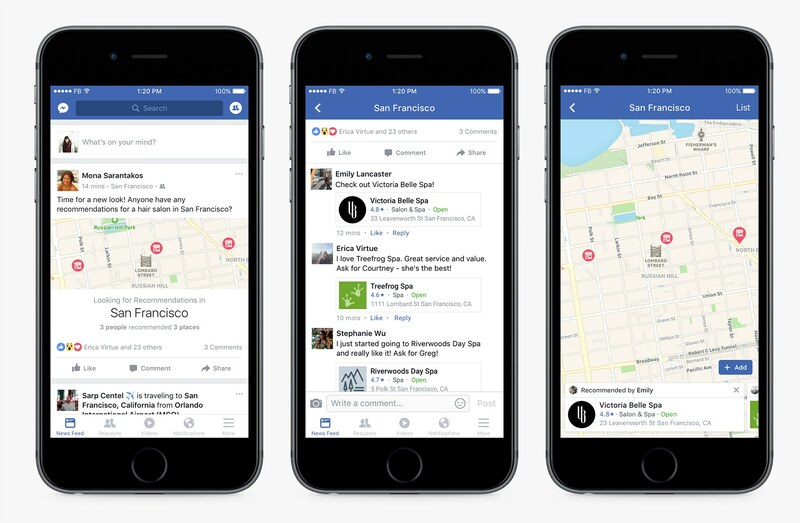 Facebook took their local search functions one step further with Recommendations, where a user can make a post that asks for recommendations and referrals in a particular area. Friends can recommend local businesses by searching for the business name within the comments box, which also shows the local places that each user has previously checked into. The business’s profile will then appear within the comment. How will Data and Privacy Laws Affect Local Search and Recommendations? Both GDPR and the Cambridge Analytica scandal are likely to cause a slowing down of developments in using data for targeting. However, recommendations do not require complex predictive algorithms, instead they are created organically from information that is voluntarily given by users. Facebook’s Recommendations are still relevant and useful to users who more often opt out of remarketing tracking, ignoring ads and rejecting businesses offers to opt-in to their data collection. What can Businesses Contribute Towards Facebook Recommendations? The most important thing that any business can do to guarantee recommendations is to offer a positive customer experience and great customer service. A strategy to boost recommendations will become more and more necessary – particularly as Facebook has announced that they will reduce the number of organic posts by businesses within users feeds. Featuring heavily in Facebook’s Recommendations will soon become one of the only ways that local businesses can use the platform to gain exposure. Ensure that all of the information about your business is correct. Companies with several stores must take particular care to personalise the information to each individual store, such as the opening hours, address, directions, telephone number and local offers. Read more on store location addresses for SEO. Consider rewarding customer who ‘check-in’ to your business on social media – such as offer double loyalty points or a discount to customers who post their updates online – or who recommend the company to their friends. Respond in a quick, personal and empathetic way to negative or neutral reviews, trying your best to resolve the issue and change the customer’s opinion. Recommendations on Facebook are a great way to drive business, however it may confuse consumers should they find bad reviews elsewhere. Consider investing in monitoring tools for social media if your company doesn’t have the manpower to efficiently deal with online complaints. When a customer shares a positive review about a great experience with your brand, consider re-sharing it across your social media platforms. Make the most of the tools that companies like Facebook and Twitter provide. Both platforms allow you to create a schedule of posts with information about offers, deals, promo codes and direct links for purchases. Lastly, consider adding a shopping cart within your Facebook page, so that customers who are recommended by their friends can quickly and easily make a purchase or booking without having to even leave the Facebook app.